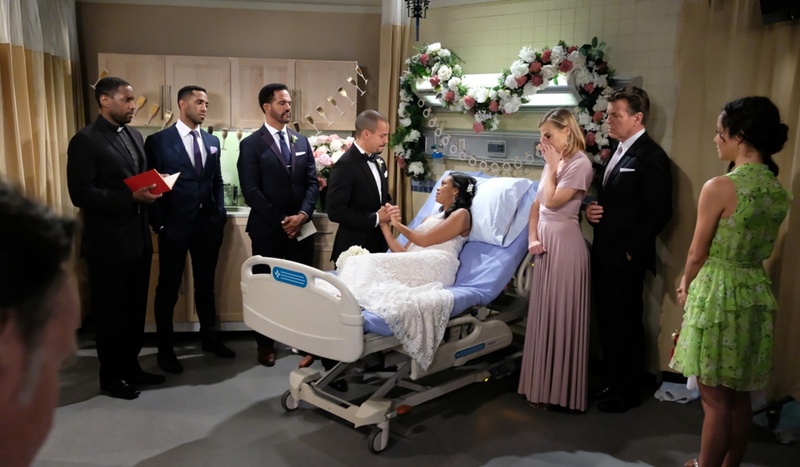 Thursday July 26, 2018: Neil and Hilary get closure, Tessa tells Mariah they need to leave today, and the guests gather for the wedding. Hilary walks down the stairs of the penthouse in her wedding gown and joins Devon for the wedding service. She’s terrified when the minister begins reciting a funeral ceremony and objects that it’s not time for her to die yet. She wakes from this nightmare in the hospital. Phyllis shows up and wishes her a happy wedding day. After discussing Hilary’s dress, she explains that she just wants to enjoy today, not fill it with regrets. At home, Devon walks down his stairs in his tux. Neil thinks he’s looking sharp. They talk about their troubled relationship and their shared problems with Hilary. Neil is happy that Devon never listened to his opinions of her and they’ve all moved ahead as a family. He’s sure the wedding ceremony will fill the hospital room with love. In the office at HWG, Lily tells Cane how devastated she is for Devon and Hilary. She tears up and asks for a minute by herself. Once he leaves, she cries. Phyllis runs into Jack in the bar of the Athletic Club. She’s tense and needs a break. He guesses her tension has something to do with Billy. She admits her attempt to get through to him backfired. She needs to be strong and positive for Hilary right now. From the look on her face, Jack manages to figure out that time is running out for the bride. Phyllis explains that Hilary is carrying on as though nothing is wrong to prevent it getting maudlin. All of this is upsetting for Jack. He’s learned never to take the people you love for granted. He promises to be there for her at the wedding if his brother isn’t. Mariah joins Tessa at Crimson Lights, who tells her they need to leave today. Mariah thought she would have more time to say goodbye, but Tessa is worried that her sister will disappear if she doesn’t go now. She wants Mariah to come but will understand if she can’t. Mariah will figure out how to leave immediately. Tessa makes her promise not to tell anyone why she is going. Across the room, Shauna worries to Charlie about Hilary. He loves her for looking out for his mom and assures her things will get better. Nate stops by Hilary’s hospital room to check on her. She thanks him for saving her so she could get married. Neil interrupts and the doctor walks off. Hilary tells him that Devon trying to act like everything is normal is very sweet. She can’t wait to get married. Sitting down, Neil reminds her that their relationship has run the gamut over the years. He hopes that they are friends. She says they failed at that. He says they are part of the same family from now on. They laugh about how they are finally getting closure. She says this is the best present he could have given her. Later, Shauna, Mattie, Mariah and Phyllis arrive with the borrowed and blue for her wedding. Hilary thanks them for being so thoughtful. Phyllis gives her a heart shaped rock and tells her it means love is always around. Mariah gives her a dirty joke book and everyone has a laugh. As the guests file out, Hilary asks Mariah to stay. She knows that she’s always been tough on her and she’s always been jealous of how great Mariah was on the show. Hilary is proud of her and says she can carry the show on her own. Mariah doesn’t think anyone would be interested in that. As Hilary starts to explain how grim things are, she passes out. Out in the waiting room, Mattie takes Cane aside and asks where her mom is. Cane leaves to find her. Mariah runs in and yells that Hilary has passed out. Everyone starts to worry about how wrong things are going. Jack urges everyone to stay positive. Cane returns to the HWG office and finds Lily in tears. She can’t go to the wedding when she knows that she was behind the wheel. Cane assures her that Devon knows he has no future with Hilary, he’s just making a happy memory and she should be part of that. Back in Hilary’s room, Nate tells Devon that Hilary keeps deteriorating. 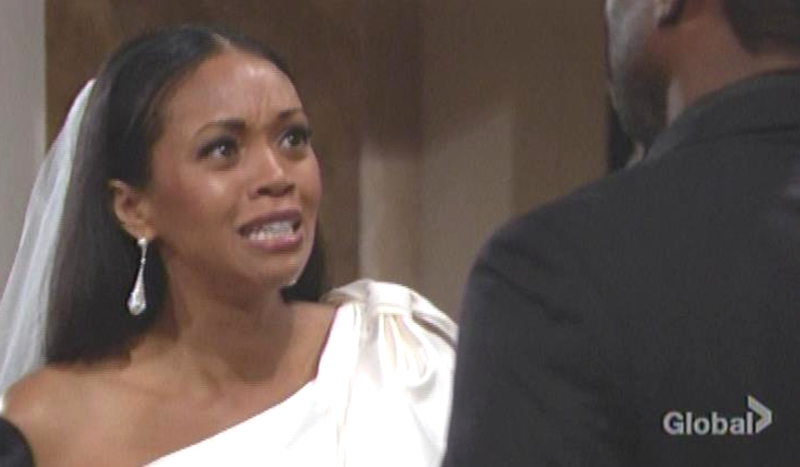 When she wakes up, Devon comforts her and she assures him she’s still up to getting married. Later, family and friends enter the room and circle around the bed. Neil reads a poem about love and then the bride and groom exchange their vows. Devon says he wanted her from the moment he saw her and this passion only grew, no matter how much he tried to resist it. He tried to deny his love for her, but it was always there. “Ditto,” Hilary says, before adding that he always came back and welcomed her. He’s the one she wants and needs and will be for every moment still to come. They get through the traditional vows with some difficulty and he slips the ring on her finger, pledging his eternal love. She puts on his ring, saying it is a circle without beginning or end. They are pronounced husband and wife and the guests clap. Victor puts his plan into action.